Clean and bright! Fully renovated floor to ceiling 2014. Located in a gated community with pools and tennis, just a short walk through the community to a sand path leads you to the beautiful beach. Villa features a wonderfully equipped kitchen with granite counter tops, bar seating, convection oven, dishwasher, sensor microwave, ice maker, toaster oven, coffee maker and blender for frosty drinks. Adjacent to the dining area, the living room has a full size sofa and love seat, large flat screen TV with 200+ channel cable, a streaming device and DVD player. The master bedroom is well appointed with a brand new queen pillow top mattress, luxury linens, ceiling fan, flat screen TV and on-suite bathroom. The guestroom features new mattresses on all the beds, flat screen TV with video games. Enjoy free wifi internet access throughout the villa. The laundry room includes a sink with high capacity washer and dryer. Listen to the wild peacocks as you relax on the private fenced patio where you will find a grill, two chaise lounges, and a dining table for four under an umbrella. Just two miles north to Port Canaveral, the fishing pier and Jetty Park. Cocoa Beach shops and restaurants are a just a few minutes south. Enjoy a breathtaking sunrise on the beach. The community offers a heated family pool with an additional adults only pool, tennis courts, basketball, racquetball, shuffleboard and a club house with free Wi-Fi. We are a Danish-American family which enjoys nature, the beach, and amusement parks! We completed a full renovation in 2014, everything is brand new from the kitchen to the bed linens. The combination of shady trees, wild peacocks, and the beautiful ocean make this property paradise. Our villa is where the clean style of mid-century modern meets the beach. Lots of unique touches to make your stay comfortable, relaxing, and refreshing. 7 minute walk through the community down a sand path to a pristine beach! No roads to cross. Villa has beach towels, 4 beach chairs, folding beach table, beach cart, cooler bag, beach toys, boogie boards, beach umbrella. 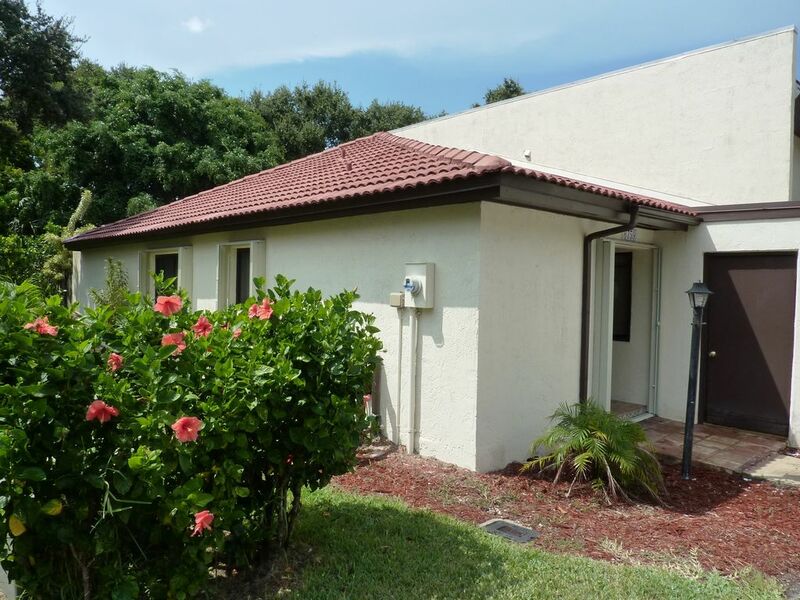 Secure gated community features 2 pools, basketball court, tennis courts, and shuffle board court. 7 minute walk to the beach through the tree lined community on a sand path. Wild Peacocks roam free, you will hear them call to each other. 50 minutes to Orlando airport (MCO), 50 minutes to Melbourne airport (MLB), 65 minutes to Walt Disney World, Universal Studios, The Wizarding World of Harry Potter, Diagon Alley, and Sea World; 30 minutes to Kennedy Space Center, 3 minutes to Cruise Port Canaveral, 5 Minutes to Ron Jon Surf Shop & Cocoa Beach Pier. Explore all of wonderful Central Florida. It was a pleasant stay thank you. Closest beach to Orlando attractions. Port Canaveral 2 miles; Victory Casino Cruise 2 miles; Jetty Park & fishing pier 2 miles; Ron Jon's Surf Shop 3 miles; Cocoa Beach Pier 3 miles; Historic Cocoa Shopping & Dining 10 miles; Kennedy Space Center 19 miles; Orlando Airport 46 miles; Sea World 56 miles; Universal Studios, Wizarding World of Harry Potter, Diagon Alley 56 miles; Walt Disney World, Magic Kingdom, EPCOT, Animal Kingdom, Hollywood Studios 66 miles.